To get the inside track on all of the great Valiant happenings in the works for 2013, join Joshua Dysart (Harbinger), Justin Jordan (Shadowman), Fred Van Lente (Archer & Armstrong), Executive Editor Warren Simons, and Chief Creative Officer Dinesh Shamdasani for “The Future of Valiant” Panel on Friday, October 12th at 2:45 pm! Valiant’s biggest year yet starts right here! And stop by the Valiant booth all weekend long to pick up a FREE “Future of Valiant” Preview, spotlighting Valiant’s biggest releases – including Shadowman #1! 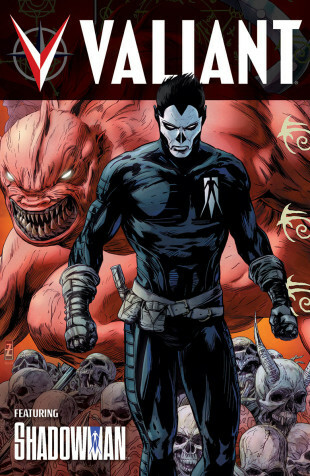 Also, look for the debut of the con-exclusive “Summer of Valiant” Collected Edition, collecting the four new #1 issues that relaunched the Valiant Universe anew. Now is the time to discover why the Valiant Universe has been captivating fans and critics all year long! Only one more week to go… We’ll see you at NYCC!